We like to work hard and play hard here at the Environmental Defense Center, and on April 1, we did just that with some of our favorite people. Our amazing volunteers! 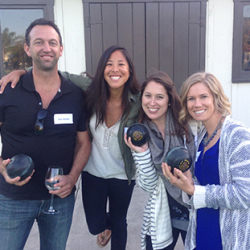 With over 100 volunteers donating more than 2000 volunteer hours annually, gathering at Santa Barbara Lawn Bowls Club for an evening of fun was one of the ways that we at EDC show how much we value their time and efforts. Whether it is helping at our TGIF events and annual fundraiser, providing office support, helping out at one of our mailing parties, or being outdoors at a creek clean-up or in the EDC garden, our volunteers provide an unparalleled level of assistance that we are so lucky to have. 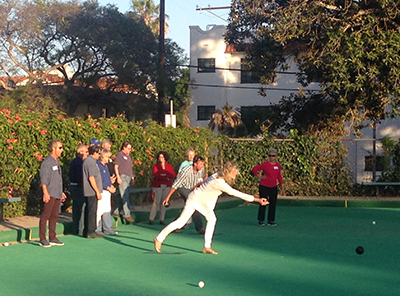 Under guidance from Bud Viard, Eileen Morton and a group of lawn bowling experts at the Club, 40 volunteers and EDC staff teamed up for a fun two hours of the exciting activity. In between games we were all able to enjoy delicious food, drinks and desserts donated by local Santa Barbara businesses; Paxti’s Pizza, Soho Restaurant & Music Club, Savoy Café & Deli, and Trader Joe’s. It was a great way for all our volunteers to get together and meet others that share common interests, and practice their bowling skills (it is much more difficult than it seems!). EDC relies on the efforts of volunteers and it is because of them that we are able to do what we do and have the successes we have. Thank you again to all who support EDC. We are truly grateful. 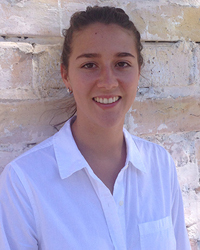 Chloe McConnell is the Environmental Defense Center’s Development Coordinator. I read in the Santa Barbara News Press that recycled oil field water is being used to water nuts, citrus and other crops. Essentially there are no regulations and a great deal of belief the water is contaminated. It doesn’t take much to know that recycled water is contaminated. What can we do to stop this?